Wanting to use up more stash and create something as well I have started knitting squares again. I am hoping to knit enough to create a new afghan it will take a while and no doubt I will have break and make something else in between. Using the book 200 Knitted blocks for blankets, throws and afghans by Jan Eaton I have started my new project. I have made these two so far so along way to go to make an afghan. 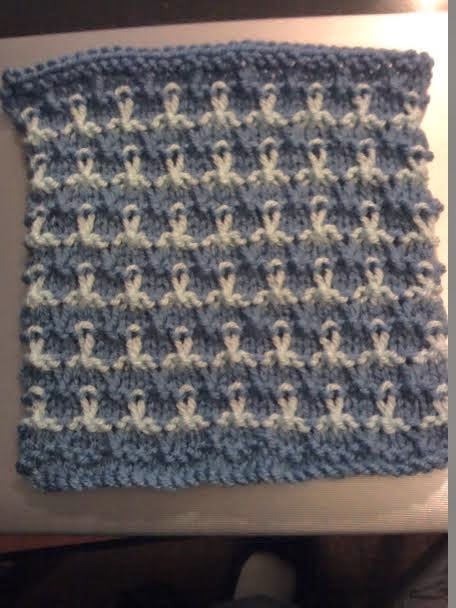 An easy pattern to follow and one that looks far more complex than it is, sadly the colour does not show up well I used a sort of petrol blue with a light blue yarn. For this one I used 4.5mm needles to get the correct width I needed. 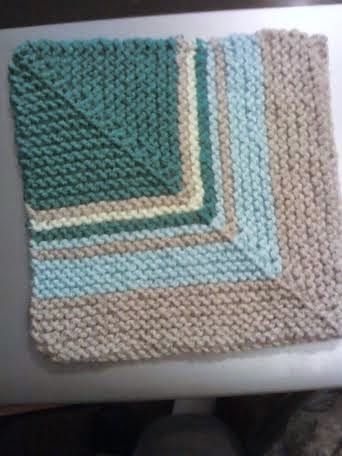 I used a beige yarn with the same light blue in the Pyramids square a green and a yellow yarn. Again a nice easy pattern and the double decrease creates the ridge down the middle. For this square I used 4mm needles. I have found you need to use different size needles to get the same size squares, so I knit the first row and measure it to the square I have already to get the same width. Too wide and I drop down a size or half a size until I get the right width. Then I make sure I knit to correct size square, this some times means altering things as I have ended up with an oblong before now. So onto the next square no idea which one I will pick as I want the afghan to be a mixture to give it added interest. That sounds like an interesting project to keep you busy over the next few months. So beautiful and interesting creations!! !